Triple Chocolate Cake is made with three flavors of chocolate mousse. Available from FinancierPastries.com. Find all types of cake here on Page 8 of our eight-page Cake Glossary. Learn about tarte Tatin, tiramisu, torte, tres leches cake and more. Click on the links below to visit other pages, or go to the overview. Check out our many other delicious food glossaries, including pies and pastries. Some people think of Tarte Tatin as an upside-down cake. It is similar, but it is a one-crust fruit pie, invented by accident in France in the early 1880s. It is served upside-down; the apples are on the bottom with the crust on top. The Tatin sisters, Caroline and Stéphanie, owned the Hotel Tatin in Lamotte-Beuvron, southwest of Paris in the Loire Valley, not far from the town of Chambord. A tired Stéphanie, preparing an apple tart, accidently left the apples cooking in sugar and butter for too long on the stove top. In an attempt to salvage the dessert, she placed the pastry atop the apples in the skillet and baked it in the oven. The tart came out of the oven with the apples deeply caramelized. Customers loved it and the Tarte Tatin was born. It is now also made with different fruits: banana, peach, pear, stone fruit, the apple-like quince; and with trends such as salted caramel. 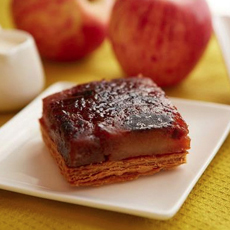 Here’s a recipe for Quince Tarte Tatin. Savory versions are also made, such as beet or onion tatin. Here’s a recipe for beet tarte tatin. 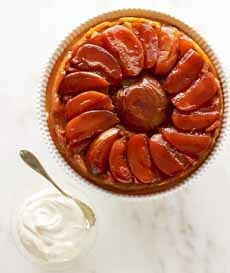 Top: Conventional Tarte Tatin .Here’s the recipe from Martha Stewart. Bottom: Tarte Tatin cut from a sheet pan. Photo courtesy Chocolate Lab | San Francisco. 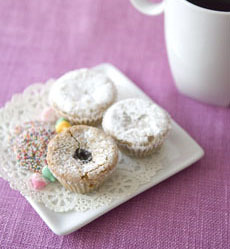 A name given to many different types of cakes or cookies that are served with afternoon tea. Each country and region has its own favorites. The commonality is that the tea cakes are finger food. They range from miniature loaf cakes to raisin buns to a Mallomar-type cookie (in Northern Ireland) to a sugar cookie (in the southern U.S.) to the Victoria sponge (jam and whipped cream sandwiched between two sponge cakes) enjoyed by Queen Victoria with her tea. Trs Cake. Photo by Corey Lugg | THE NIBBLE. The industrial term for confectioners’ sugar. 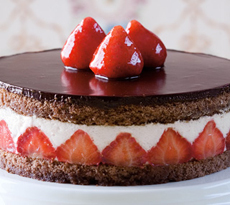 A dark chocolate cake of four layers with a vanilla cream filling. It is iced with chocolate buttercream, to which 6 tablespoons of cola and a cup of chopped pecans are added. THOUSAND LAYER CAKE or TWELVE LAYER CAKE. Thousand layer cakes are like thousand year old eggs:* The number is highly exaggerated (the cakes often have 12 layers and the preserved duck eggs are no more than 100 days old). But that doesn’t take away from the enchantment. The thousand layer cake recipe originated in the colonial Dutch East Indies, now Indonesia; the Dutch name is known as spekkoek. Originally flavored with local spices, they are now made in a variety of flavors. See our review of Euforia Confections’ thousand layer cake. For other many-layered cakes see Mille Crêpe and Smith Island Cake. 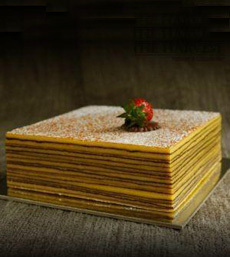 Thousand Layer Cake, also called Twelve Layer Cake. Photo courtesy Euforia Confections. While there are many variations of this Italian recipe, it is typically composed of layers of sponge or ladyfingers, soaked in espresso liqueur or a similarly flavored syrup, and layered with a mascarpone cheese and custard mixture; then dusted with cocoa or shaved chocolate. The name means “pick me up,” from the espresso flavoring. 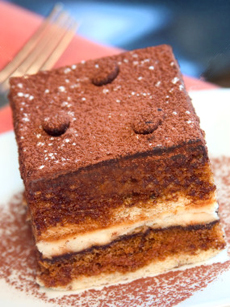 Here’s the history of tiramisu. It is sometimes called an Italian trifle, although it is much lighter than a traditional trifle. Torte is the Austrian, German and Hungarian word for cake. 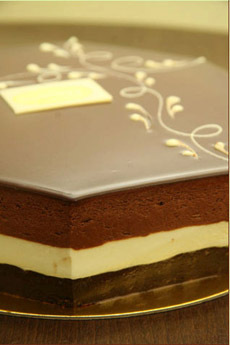 Tortes are always round and generally shorter and wider than cakes, as well as denser and less delicate. This denseness and shortness are often due to the use of ground nuts in place of a portion (or all) of the normal amount of flour. Tortes are made without chemical leaveners, using egg foams for lightness. 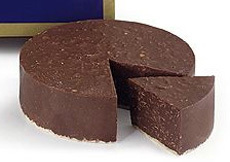 In addition to the fillings traditionally used by American, British and French cakes, tortes also use marzipan (ground almond paste) as a filling. Strawberry coconut torte. Get the recipe. Photo courtesy Lindt USA. What’s the difference between a cake and a torte? It depends on whom you ask. But essentially, torte is the German word for cake. As opposed to a pound cake or a more casual cake, a torte denotes a rich, dense cake made with many eggs and little or no flour, using ground nuts (and sometimes breadcrumbs) for texture. Tortes are also are shorter and wider—often no more than 2-1/2 inches high, and 10 to 12 inches in diameter—the original style. Today, many bakers and recipe writers call their cakes “tortes,” possibly in order to make them sound different and more exciting. More accurately, in the U.S. the term should be used to describe a shorter, wider cake. 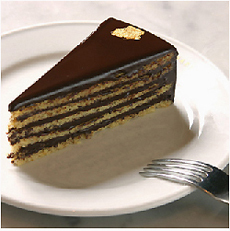 Hazelnut torte, thin layers of hazelnut cake and bittersweet ganache, by pastry chef Pierre Rebout. Photo courtesy Wallse | New York City. A tart is not a torte! A is not a cake. It is a filled pastry shell. The word is mis-used by people who don’t know better. Just because you see it in print online doesn’t make it correct! A sponge cake that is baked, perforated and soaked in three different milk products (the tres leches—evaporated milk, sweetened condensed milk and whole milk) such that the cake absorbs the milk. It is a favorite cake for celebrations throughout Central America and has become popular in the U.S. (Jenna Bush Hager served it for her wedding cake). It is served with whipped cream. 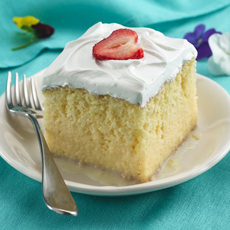 Tres leches cake most likely originated in Nicaragua in the early 1900s. The recipe was printed on the label of sweetened condensed milk cans to spur sales of the product. Tres leches cake. Photo courtesy Betty Crocker. 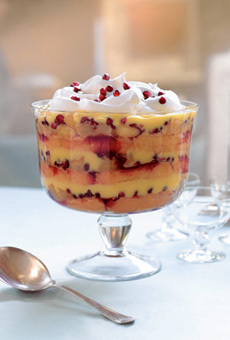 A trifle is a multilayered dessert that begins with a layer of cake on the bottom, often split and sandwiched with jam; the cake has alternating layers of custard, fruit and whipped cream. Spirits that complement the fruits are frequently used to flavor the cake layers (sherry, Grand Marnier, liqueurs). It is generally composed in a glass bowl or individual goblets so the beauty of the individual layers can be enjoyed. Today’s elaborate trifles—which are hardly trifling—began as more humble desserts many centuries ago in England, and began to evolve to their current fancy state in the mid-18th century. Trifle. Photo courtesy Pom Wonderful. A tall, round pan with a tube-shaped aperture in the center that leaves a hole in the middle of the cake. 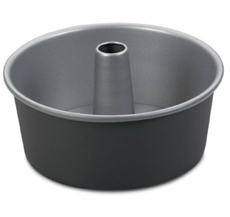 Generally used for light, airy cakes like angel food, the center tube enables the cake batter to rise higher. For the most flexibility, buy one with a removable bottom. A Bundt pan, which also has a hole in the center, isn’t a substitute for the same effect, because it is made to create a shorter, dense cake, and the fluted sides can make releasing the cake more difficult. Tube pan. Photo courtesy Cuisinart. 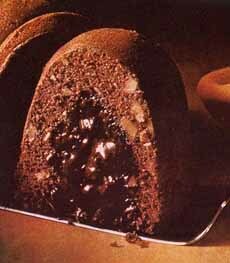 The Tunnel of Fudge Bundt cake placed second in the 1966 Pillsbury Bake-Off. The cake was created by Ella Rita Helfrich of Houston. Adding a circle of Pillsbury Double Dutch Frosting Mix on top of the batter, halfway through, created a moist circle of “fudge” in the center of the cake. Bundt pan sales jumped exponentially, and like other recipes, Tunnel Of Fudge became all the rage. The frosting mix was discontinued, and subsequent recipes were re-worked with cocoa powder and later, chocolate pudding mix. The first prize winner? Golden Gate Snack Bread, a yeast bread made with instant flour, processed cheese spread, dry onion soup mix and butter. Tunnel Of Fudge Cake. Photo courtesy Cooks Info. This cake was originally made in a skillet and called skillet cake; fruit was set on the bottom with the batter poured on top. The baked cake is inverted, and the fruit that was once at the bottom forms a decorative topping. When canned pineapple rings became available in the first half of the 20th century, Pineapple Upside Down Cake became the rage—often with maraschino cherries in the center of the pineapple rings. As the recipe evolved, cooks put their skillets in the oven to bake. Nordicware, creator of the bundt pan, created a special round pan with indentations for the pineapple slices, guaranteeing an even presentation. Upside Down Cake is related to the Tarte Tatin, an accidental upside-down pie from 1880s France. Also see Tarte Tatin, above: an upside-down tart. 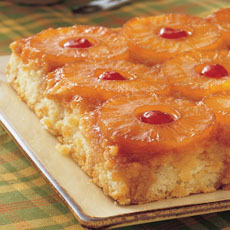 Top: Pineapple upside-down cake. Photo courtesy Betty Crocker. Here’s the recipe. 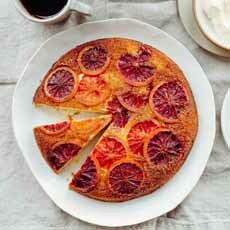 Botton: Blood Orange Upside Cake. Here’s the recipe. The tea cake particularly enjoyed by Queen Victoria (1891-1901) was a sandwich of two sponge cakes, filled with layers of jam and whipped cream. After her husband, Prince Albert, died in 1861, the Queen spent time in retreat at the Queen’s Residence (Osborn House), her summer home on the Isle of Wight. According to historians, it was here that the cakes were named after her. However, credit for creating the tradition of tea is owed to Anna, Duchess of Bedford (1788-1861), one of Queen’s ladies-in-waiting. There was a big stretch between lunch at noon and dinner at eight, and the duchess became famished at about four in the afternoon. 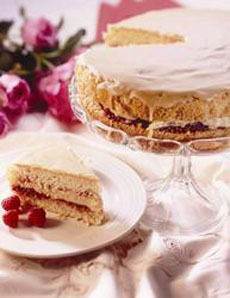 Get the recipe for this Victoria Sandwich Cake from Billington’s Best Of British Recipes. At first, she had a pot of tea and a few breadstuffs brought to her dressing room. But later, she invited friends to join her for a late afternoon meal of small cakes (which became known as tea cakes), bread and butter sandwiches, assorted sweets, and a formal tea service. The practice of inviting friends to come for afternoon tea was quickly picked up by other social hostesses, including Queen Victoria. A four-layer sponge cake filled with two layers of plain buttercream and a middle layer of chocolate buttercream. It is frosted with plain buttercream, then sprinkled with crushed peanut or almond brittle. Viennoiserie is not cake but laminated pastry dough, an expensive (because of the amount of butter needed) and time-consuming process (because the butter is folded in-between layers of dough). This technique is used to make the flaky “breakfast pastries,” croissants, danish and brioche. It is a marriage between traditional bread baking and sweet pastry baking. 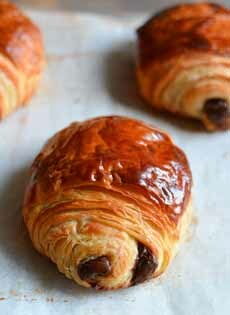 You can see the striations, or layers, of pastry when you look at the top of the Viennoiserie or when you cut into them, and you can pull apart the layers of the baked dough. You can see the layers of laminated dough. Photo courtesy Sprinkled With Jules. Here’s the recipe. A Viennese specialty made from several layers of crunchy waffles and nougat. Waffeltorte. Photo courtesy of Demel.at. In America today, a wedding cake is typically a large, multi-tiered cake with white icing, although the cake and filling inside can be whatever the bride desires (First Daughter Jenna Bush chose a tres leches cake). Some brides choose a very plain cake decorated simply with fresh flowers, others like elaborate decor with spun sugar flowers, birds and iconic columns holding up the layers. The cakes can be covered in butter cream, royal icing or fondant. 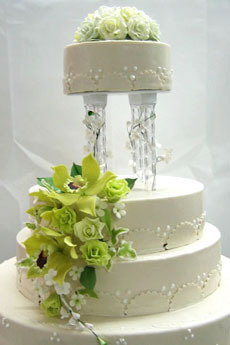 Traditionally, a ceramic bride and groom have topped the cake, but often tradition gives way to flowers or other decoration. As can be seen on the Food Network, those who can afford designer cakes can have majestic works of art that don’t look like wedding cakes, but are cake sculptures that represent anything from where the bride and groom met (an art exhibit at a museum) to their hobby (flying planes or scuba diving) to a fantasy of a princess being rescued from the tower by a prince on horseback. Wedding cake. Photo courtesy FinancierPastries.com. Today’s coffee cakes and crumb cakes are popular examples of yeast cake. Wild yeast was the original raising agent; after the yeast were cultivated*, yeast cakes remained the earliest type of what we now know as the modern cake. By the mid-eighteenth century, the discovery of beaten eggs as a raising agent led to much more elaborate baking, and the more primitive yeast cakes fell out of favor. The beaten batter was poured into molds as simple as tin hoops set on parchment paper on a cookie sheet (from which modern cake pans developed). 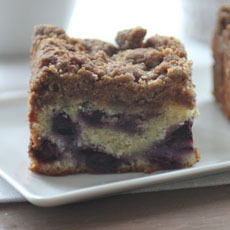 Blueberry crumb cake. Photo courtesy BellaBaker.com. *In 1859, Louis Pasteur identified that yeast was a living organism and the agent responsible for alcoholic fermentation and dough leavening. He discocovered that yeast feeds on the starches in flour, producing carbon dioxidel the carbon dioxide expands the gluten proteins in the flour; and the gluten proteins cause the dough to expand and rise. Nine years later, Fleischmann’s Yeast was founded, and the modern baking era, with commercially-available yeast, was born. 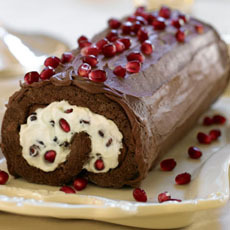 A yule log, or bûche de noël. Photo courtesy Pom Wonderful.